Disclosure: Some of the links below are affiliate links, which means that at no extra cost to you, I earn a small commission if you click and make a purchase. Please note that to ensure my impartiality, I first make my recommendations and then, I check the possibility of affiliation. I do it with the sole purpose of financing the costs associated with the creation of more valuable content for this blog. Thanks for your support and understanding. Missing time to read this guide online? Download a Free PDF version. Enter your information to get your a download link by email. Subscribe to my channel and be notified when I publish new videos! If I ask you, “Have you optimized your LinkedIn profile? “. What will your answer be? If the first answer that comes to your mind is that your profile is complete, it is likely that it is not optimized. The majority of professionals have a LinkedIn account, but very few invest the effort to optimize it. Why should you optimize your LinkedIn account? You should know that LinkedIn has more than 590 million users including 260 million active users and that the platform is growing at a frantic pace of 2 users per second! On LinkedIn, 61 million users are senior influencers and 40 million are in decision-making positions. In addition, 9 out of 10 recruiters refers to LinkedIn when they search for candidates. It is also interesting to know that 44% of users earn more than US$ 75,000 per year. LinkedIn can offer you exceptional visibility with professionals, people in positions of authority and recruiters, but also with potential high-income B2C customers and B2B customers. For the latter, 50% of B2B buyers use LinkedIn to make purchasing decisions. That makes LinkedIn a leader in social selling in both B2C and B2B. In this context, optimizing your LinkedIn profile will allow you to take full advantage of this visibility that the platform can offer you. For example, simply adding a profile picture will give you 21x more views and 36x more messages. And this is only one of the 17 steps described in this guide! Optimizing your entire profile will increase your visibility and, by the same occasion, increase your chances of reaching your career goals, stand out, make a good impression, position yourself in your industry and attract the best opportunities! 4. A summary that begins with your why! 10. Connect with all those who inspire you! 15. Looking for work and open to opportunities? Indicate it! 17. You now have a great profile? Make it public! The headline is the title that appears under your name. By default, the headline will display the title of your current job followed by the name of the company you work for. Is it really wise to keep this title? It all depends on the title in question! In general, companies assign titles that are almost always general and generally unoriginal, so it is often wise to change it. Especially knowing that a headline well selected will get you 14 times more visibility in terms of the number of views on your profile. The reason is that your headline, when chosen wisely, helps you stand out in the search results. To optimize it, you must consider the following 3 essential elements. Element 1: Select a title that represents one or two of your main skills. You should appoint yourself as an expert or specialist in one or two of your main areas of expertise or more specifically in the areas of expertise for which you want to be recognized. It is possible that your past experiences may not reflect your future career goals, strengths, and abilities. It is therefore wise to choose a title that corresponds to your expertise that will help you find the desired job and not the expertise related to your past experiences. Because it’s easier to rank in search results with a Long Tail keyword consisting of three words or more. It’s also easier to go out with a lower competition keyword. For example, if you are a biologist, you have every interest in including your specialization as a molecular and cellular biologist. Indeed, there are much more results for the keyword biologist alone and much more competition, than for the long tail keyword Molecular & Cellular Biologist. The reason is that there is a lot less competition in LinkedIn for Personal Branding Expert which generates 312,601 search results based on my current network, compared to 2,136,900 for Personal Branding Specialist and 2,578,844 for Branding Specialist. In the first case, I manage to rank in the first page, always according to my current network, whereas in the second case, I rank in the second page and I am totally absent from the search results for the last one. Note that when I say absent, it’s literally and totally absent since LinkedIn limits search results to 1000 profiles. […] we’ve set a limit to the number of connections you can view on your search results page, both in Sales Navigator as well as LinkedIn.com. You can now view only 1,000 connections on your search results page. This limit ensures the accuracy of your 1st degree connections, and streamlines your 2nd and 3rd degree connections. This excerpt also helps you understand why I say, based on my current network. This is because LinkedIn considers a multitude of parameters in the search algorithm, including the degree of connection. It prioritizes your 1st, 2nd and 3rd-degree connections in the results display. So it is possible that your results differ completely from mine, however, for the same network of connections, your results will improve if you use long-tail keywords chosen wisely with a low level of competition. The reason is that the longer your title the more the importance of each word or title is diluted. That is to say, I would rank better in search results with only Personal Branding Expert as a headline rather than Personal Branding Expert and Digital Marketing Specialist. The second part of the title dilutes the importance of the first in the LinkedIn search engine. This means that if part of your headline is not essential, you should remove it. As an example, I had the Entrepreneur and Public Speaker designation in my title, but since these keywords are extremely competitive (more than 2M results for entrepreneur) and consist of a single word, it was wise for me to remove them, considering that they were diluting the importance of my other two main titles. We all have a LinkedIn profile picture (or almost), but I’m asking you: is your profile picture optimized to meet the professional standards of the LinkedIn platform? Unlike other social networks like Facebook or Instagram, LinkedIn has a very professional orientation and therefore, your photo must meet certain standards if you want to stand out and transmit a professional image. Sharp, good-resolution photo – minimum resolution 400px X 400px. A neutral background that contrasts with the colors of your skin, your hair, and your clothes. Choose a plain white, black or colored background, or a blurry and bright background. A close up of your face well centered in the frame. Your eyes should line up with an imaginary line at 2/3 of the photo. Wear clothes that represent you well and that showcase yourself. You can’t afford a photographer to take a professional photo? Here is a short tutorial that shows you how to use Adobe Photoshop to remove the background of any photo and add a white, black, colored background or even a blurry and bright background. I also show you how to add a colorful outline with your face in black and white. You can download the Photoshop file that I made in this video! Each design is grouped and well identified, and can serve as a guide and inspiration for your own design. Take advantage of your free month with Adobe Photoshop to make your design. Note: Adobe also offers a 60% discount to students and teachers here. Photoshop is a great tool for who gets to use it! However, beware of frequent mistakes when selecting your photo. Photo taken from far or too zoomed. Logo or lettering added to your photo – it’s usually impossible to read! The size of the banner in 2019 should be 1328px X 332px. Your banner should be the in line with your brand guidelines, with your color palette, your fonts and the style of your images. For example, your profile picture may include a color reminder in a colored outline of your brand’s color, which is also reflected in your banner. Get inspired: 15 LinkedIn profiles with exceptional designs that will inspire you! 4-Summary that begins with your why! As Simon Sinek explains in his book Start with Why and in his very popular video with over 17 million views combined below, inspirational leaders tell their stories starting with their why! They start with the essence, the intention, the reason behind their actions! The Purpose! Then, they explain how, how they will achieve their vision, that is, the actions they will take to realize their dreams, and turn them into reality for themselves and for others. Finally, they present their what, that is, the end in itself. This is exactly the way you should build your resume in LinkedIn! In his video, Simon gives the example of Apple who communicates with this method. Why: All we do, we do it with the firm conviction of challenging the status quo and doing things differently. How: We do this by manufacturing products with exceptionally designs easy-to-use and userfriendly. What: It turns out that we make computers. Everything I do, I do it with a burning desire to turn creative and innovative ideas into successful startups and help others do the same! With the ultimate goal that together we can build businesses that will have a positive impact in the world. To achieve this, via my blog davidgaudreault.com, I help entrepreneurs, professionals and executives to become their own media and stand out by taking advantage of a well-defined and well-established personal brand, a strong digital marketing strategy and an engaged community! A community that will be a voice to propel all entrepreneurial, social or community projects. Are you ready to start building your personal brand to finally stand out, show the world the best of yourself and build an engaged community that will be the voice of your next project? Check out my blog, guides, videos, social media, etc. Note that I start my what with a question. This is an interesting way to challenge your reader. It’s good to inspire humans, but you must also make yourself understood by robots! Robots include the LinkedIn search engine or the Google search engine, which will scan your profile summary, calculate the density of each word and assign a level of importance to each of them. So if you are doing digital marketing, you have every interest in using this keyword and its synonyms in your description. When LinkedIn adds the number of occurrences of your keyword digital marketing and its synonyms and divides it by the total number of words, it will give a high density and a high level of importance to this word. That said, you need to avoid keyword stuffing, that is, overloading your profile with keywords. Each of the keywords must be integrated naturally in your text. I also recommend you add a More about me section to list your skills, your strengths, your abilities and the tools you are proficient with. This way if a recruiter search for a specific element, you will have more chance to rank in the search results for that specific term. Speak at the first person and be warm and friendly! Do you have a dream job in mind? Adjust your profile summary to the description of your dream job. Use numbers and statistics: If you have quantifiable achievements, include them in your summary! Ex. Under my direction, the revenues have exploded by 234% … During my reign, the online conversion went from 5.4 to 10.2%! Be precise in your numbers, do not round up! Avoid frequent words! For example, saying that you are punctual, efficient, patient and organized. These overused words will not help you stand out and will make your profile rather dull and pointless. LinkedIn gives you the ability to attach media to your resume. You can share a portfolio of images or documents that will allow recruiters to appreciate the quality of your work. The file size cannot exceed 300 megapixels. The maximum resolution of images cannot exceed 120 megapixels. However, you can share other types of files by sharing a link to the server where your file is hosted. That said, is using this section to highlight your past work the best way to stand out? This is most certainly a good way if you are an artist or a creative who can display images of your creations. However, if you are an accountant, I would avoid publishing your last financial statement! If you really want to stand out with the use of media, publish honest and authentic videos that will highlight your personality. Your future employer, collaborator, partner, investor or co-founder wants to know if you are friendly, social, interesting, pleasant, positive, dynamic, etc., and only the videos can show it! To add videos, you need to host them on a site like YouTube and share the video link as shown in the animation below. Why on earth would you like to have a custom URL for your LinkedIn profile? The first reason is to facilitate the sharing of your LinkedIn profile. For example, if you want to put the address of your profile on your business card, with a custom URL, you can simply write the custom section of your URL and people will be able to access your page. The second reason is that you will be easier to find for anyone looking for your name on LinkedIn or on Google. This is a basic rule in SEO, search engines always favor the URLs containing most of the keyword without dates, random numbers, names of categories, etc. You can customize your URL easily from your profile by going to Edit Public Profile & URL. If you have a personal blog, include it in your contact information so that everyone who visits your profile will be able to visit your blog. Do the same with your Twitter account! You can also enter your email address and phone number. These are essential if you want to be contacted by recruiters! This section is very important! First, you should know that by default, the skills that appear in this section are the skills for which you have received endorsements and therefore, not necessarily the skills you want to promote or for which you want to be recognized! You should, therefore, add all the skills that correspond to profile and put them in order of importance. In addition, you should pin your Top 3 skills that define you the best or the skills for which you want to be recognized. Know that LinkedIn will overweight your top-ranked skills (top of the list) in search results as opposed to your lower-ranked skills (bottom of the list), hence the importance of categorizing and ordering them well. In addition, it will also overweight the skills for which you have received a lot of endorsements. You should, therefore, ask your contacts to endorse you for your skills at the top of your list! The more endorsements you have, the higher your chances of performing in the search results for the skills that match you. It should be noted that LinkedIn places greater importance on endorsements from people who are themselves very competent for the skill in question. That is to say, it is in your interest to obtain endorsements from experts in your industry or in your field. One way to get endorsements without explicitly asking a “favor” to your contacts is to endorse the skills of your contacts and in return, they will thank you by doing the same for you! To get recommendations, it is best to be proactive and explicitly ask your contacts. Obviously, do it sparingly and with the people who appreciate you and who will gives you value recommendations! Beware of poisoned recommendations. If they say about you that you are good companies, sociable and punctual, it does not do you justice as an expert in your field! If you receive recommendations that do not do you justice, do not hesitate to hide them. Show only the good personalized recommendations that really make you worthwhile. 10-Connect with all those who inspire you! The LinkedIn platform has a very professional orientation and members are generally inclined to accept new connections in the spirit that in business we never have too many contacts! As a result, it is possible to ask anyone who inspires you or shares your professional interests to connect with you! You must do it with a personalized explanatory note, explaining the reason why you would like to connect with the person, but if you do it right, professionally and connect with people who actually share your interests, you will get an acceptance rate between 40% and 70% depending on the sector of activity. My name is David, I looked at your profile and we both share a real passion for “field of interest”, so I thought it would be a good idea to connect with you. All social networks combined, an acceptance rate between 40% and 70% is extraordinary and considering the reach that you have in LinkedIn with your contacts, it is absolutely awesome! It will probably not last, so better to enjoy it. You can use search filters to target the right people in your industry-employees, partners, customers, investors, or potential employers who share your interests and build your dream business network! A network that can hold up to 30,000 contacts without counting your followers. A network of people who may be interested in your content, projects, services, products, and skills. People who can eventually be the voice to promote your projects, who will be potential customers to grow your business or who will be your future employers! Accumulating connections is of little interest if you do not take the time to look at each of your contacts and learn as much as you can about each of them. This means that while reaching a large network is enticing, you have every interest in focusing on quality rather than quantity! A good way to learn about your contacts is to take an interest in their activities by reading, commenting, liking and sharing their publications. That said, you too must make yourself known to your contacts and it is through your comments, publications, articles and videos that you will achieve this goal. It is therefore very important to shine by your uniqueness and let a good dose of your personality shine through each of your publications! Videos are the perfect tool to highlight your personality, but to be honest, it’s rather intimidating to post videos on LinkedIn since this network is made up of your professional contacts. Bosses, present or past colleagues, future employers, in short, all people in front of whom we would avoid drinking too much in a party, all people in front of whom we want to make a good impression. So it’s scary to publish videos in LinkedIn and I think we all agree to say that it is better to be careful and avoid getting into the dishes. But are we right to be afraid? In fact, despite their positions, titles and status, your LinkedIn contacts are primarily ordinary people and ordinary people like videos! This means that the first video you will do may not be perfect, but it will be perfect in all its imperfections since it will be a step in the right direction. From the moment you publish your first video, you’ll start (1) getting in touch with your audience and (2) getting to know your network. Believe me, the two elements combined are worth far more than the fear of publishing! If you have been in a job for many years and suddenly start contacting all Montreal recruiters, commenting on publications, building your portfolio of content, etc., it is likely that your sudden eruption of activities will alert your employer! Be consistent and regular in your activities! Trust relationships are not built in a few weeks or months but over many years. If you are dormant for years without ever participating in discussions, the day you will be in need, your network will probably not be there to help and support you. If, on the other hand, you are constantly and regularly active, publish content that adds value to your network, build a relationship of trust with your contacts, your network will be there for you when you need it and you will position yourself for great opportunities. Are you good? So show it with your achievements. Nothing better than tangible achievements to prove yourself. You have written a book or an academic publication? Have a patent, certification, awards or honors? Add them to this section. Do you master several languages? It is also in this section that you must indicate it! Recruiters often exclusively use the current job field to do their research. So if you write “unemployed” or “looking for a job”, you will never go out in search results and you will fall into oblivion. So be sure to always indicate a current job and a headline and preferably these fields should contain one or two of your main expertise as explained above. In the context of a job search, if you were creative director (a very general title and not very descriptive), but the expertise for which you want to be recognized for your next job is Expert in management of creative teams, You should create an additional experience related to your personal website / blog and include this title as a regular job, in addition to using this title in your headline. Years of experience do not guarantee competence! Experience! An element badly evaluated in our society, overestimated and much too compensated. Historically, under the seal of years of experience, large companies give higher wages, more vacations, benefits, taxable profits, in short, a nice range of benefits to reward the years of seniority. However, all these benefits are granted regardless of the development, progression, performance, growth, and evolution of the person, and regardless of the contribution of knowledge, expertise, ideas, and results. This means that two people with the same number of years of experience can be at a very different skill level! Fortunately, more and more companies are placing less emphasis on experience and more on strengths, skills, performance and tangible results. In business, you can grow as a manager or a technical expert. In both cases, your experiences should reflect a steady progression, a desire to move forward, learn, evolve and grow. The same is true for entrepreneurs and self-employed people who should constantly evolve, grow their business and do multiple entrepreneurial projects. If your 20 years of experience consists of 20 years of procrastinating and doing the same work for 7305 days, in the balance of experience, you have no more than the equivalent of 1 or 2 years of experience. That is the average time needed to become functional in a job. If, on the other hand, you have grown steadily and progressively over 20 years, by putting twice the efforts, now sitting on the IEEE committee, taking an executive position, growing your business or multiplying business projects, your experience weighs much more in the balance. Companies have long rewarded loyalty, but with the opening of markets, the performance requirements force companies to adapt and encourage performance and results. They do not necessarily need to evolve vertically. They may very well evolve horizontally, but they should, as much as possible, demonstrate your desire to learn and grow as a person as well as demonstrate progress. That said, if there is one element that is cast in the concrete in our profile, it is our experiences that are well anchored in our past choices. Love it or not, we are stuck with them! So if you’ve been complacent in a professional routine that you enjoyed, but currently do not allow you to stand out with a dynamic experience profile, you can now be proactive and take the necessary actions that will allow you to energize your journey for constant growth, development, and learning in the years to come. 15-Looking for work and open to opportunities? Indicate it! Report your interest to recruiters of companies for which you have created job alerts by checking Yes to the Alert preference. Increase your chances of being seen by sharing your full profile with employers when you leave LinkedIn to apply on an external site, by checking Yes to the Sharing your profile when you click apply preference. Translating your profile into your second or local language makes it easier for local recruiters to find you. To translate your profile, you must go to Add profile in another language, and translate your profile into the desired language. Note, however, that not all languages are supported. 17-You now have a great profile, make it public! Then, without going into the details of each parameter knowing very well that everyone has their own privacy preferences, I recommend that you set the following 6 essential parameters to optimize your visibility and your chances of positioning yourself for future opportunities. Who can see your last name: everyone. Manage who can discover your profile: everyone. Profile viewing options: Your name and headline. 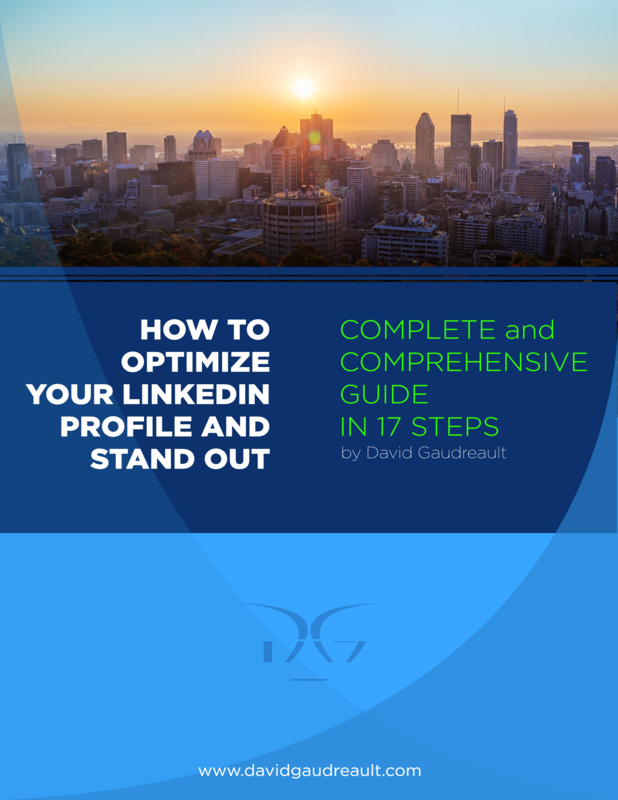 In this guide, I covered 17 essential elements to optimize your LinkedIn profile, increase your visibility and really stand out. What elements do you believe will have the most impact on your visibility? In English or French, I will be there to answer your questions. If necessary, you can click on each of the links below to revisit one section.